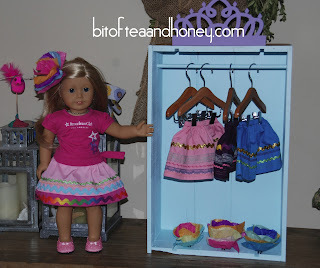 So I saw this post by Lil Blue Boo: a clothing storage rack for American Girl dolls. It got me thinking. Closets for dolls are not cheap. I knew I could make one for very little. Then it occurred to me: what I need is an old wooden wine crate! I'll just go to a store that sells wine and get one for free! Easy, right? Well, actually, no. Apparently they don't really ship wine in wooden crates anymore. And if a store has them, it is not giving them away. So I asked around and good ole Dad had one! I added a dowel inside by measuring carefully for level, then drilling a hole on both sides. I slid the dowel in, and Big Sis and I painted it up.